Marine harvesters dig for clams or worms in the tidal flats between Trenton and Mount Desert Island in this May 2016 file photo. Bills that would allow people to harvest marine organisms in the intertidal zone next to Acadia National Park have been reintroduced to Congress after previous legislation failed to get approval into law last year. 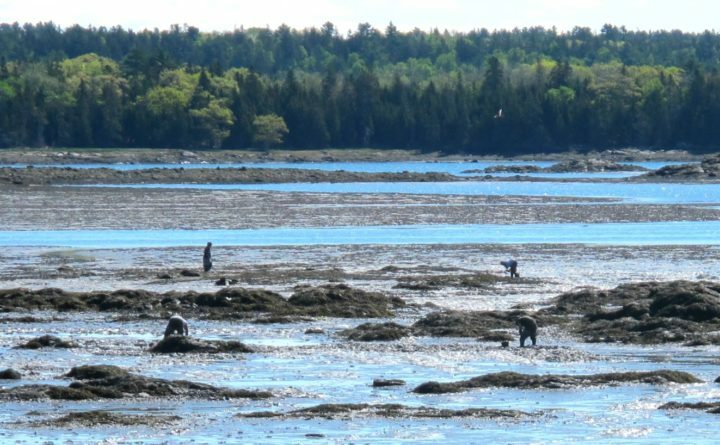 Federal legislation aimed at allowing marine harvesting to occur along Acadia National Park’s tidal mudflats and requiring congressional approval for any expansion of the national park has been reintroduced in Congress. All four members of Maine’s congressional delegation said Friday that they have submitted companion bills in the House and Senate. The bills are updated versions of bills that Sen. Angus King and then-U.S. Rep. Bruce Poliquin submitted in January 2017. The House passed the bill in March of last year but, though the bill did get through committee in the Senate, it was not approved by the full Senate and lapsed at the end of the 115th Congress. As a result, with a new Congress now in place, the bills have to be re-introduced to begin each chamber’s committee review process anew. The issue of harvesting worms, clams and seaweed from the shoreline surrounding the park came to a head in 2016 as Acadia rangers increased their scrutiny of such activities and, at times, have told harvesters they have to leave. The bill, if approved, would allow clammers, worm diggers and other marine harvesters to continue to ply their trades by traditional means in the intertidal zone along the park’s shore. The legislation also would give congressional approval to the 2015 addition of 1,400 acres to Acadia at Schoodic Point, on the eastern side of Frenchman Bay. The land is where the Schoodic Woods Campground now is located. Though no one objected to the land being part of the park, the manner in which it was transferred — without direct approval by Congress — angered officials from surrounding towns who say the transfer violated the intent of federal legislation passed in 1986, which requires Congress to vote in support of any expansion of the park beyond a set limit. In accepting the land from an anonymous donor, National Park Service officials said at the time that a separate federal law adopted in 1929 gave the park the authority to accept the 1,400 acres without a vote by Congress. The bills would eliminate the park’s ability use the 1929 law as authority to expand beyond the 1986 boundary limit. The proposed legislation also would remove use restrictions on a piece of land in Tremont where the town’s K-8 school is located, which was deeded by the park to the town decades ago. It would also make the Acadia National Park Advisory Commission, which includes residents from surrounding communities, permanent.